In April 2016, Orion entered into a binding option agreement to earn up to a 73% interest in Masiqhame Trading 855 Pty Ltd (Masiqhame), which holds a prospecting right covering an area of almost 980km2 located 80 kilometres north of the PC Project (Figure 1). The Masiqhame Prospecting Right is located in easily accessible flat-lying countryside and is well situated with regional grid power and rail lines within 10km of the site. A good all-weather dirt road passes within 800m of the deposit. Pegmatite hosted mineralisation such as lithium, beryl and REEs in the Orange River pegmatite belt. 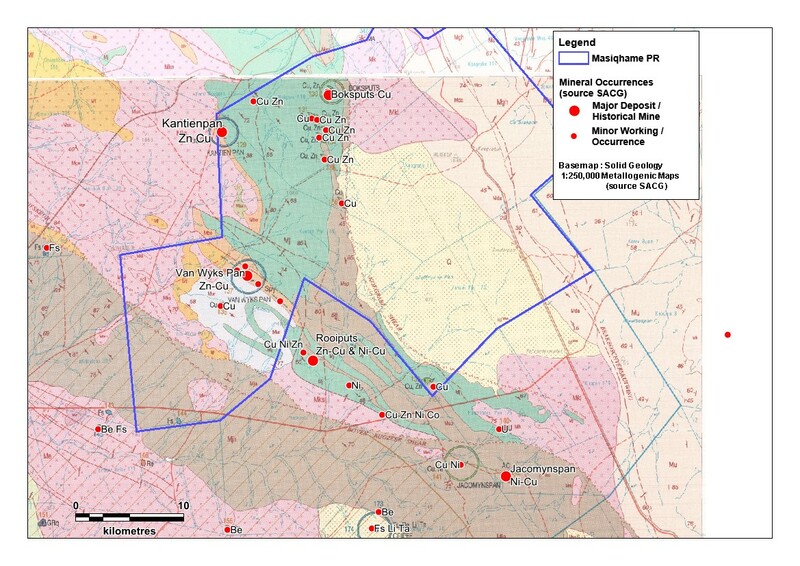 Orion believes that the integration of geochemical and geophysical methods may quickly enable new targets to be identified within the Masiqhame Prospecting Right, which overlies a highly prospective VMS horizon extending over more than 30km of strike. This horizon contains numerous published occurrences of copper-zinc and zinc-copper mineralisation associated with massive sulphides. Figure 1: Plan showing location of the Kantienpan Deposit and other mineral occurrences within the Masiqhame Prospecting Right (du Toit, 1998)*. *Du Toit, M.C, 1998. The metallogeny of the Upington-Kenhardt Area. Explanation: Metallogenic Sheets 2820 and 2920, South African Council for Geoscience, 108p. 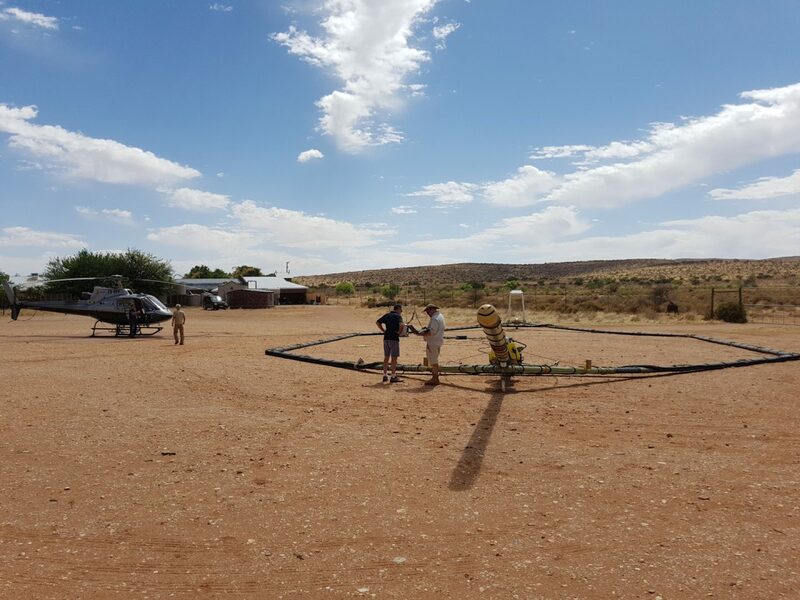 Mapping and sampling of the outcropping massive sulphide has been carried out since colonial settlement was first established in the Northern Cape. Numerous companies including Anglo American, Phelps Dodge, Anglovaal and Iscor (now Kumba) have explored the Areachap Terrane. The success of exploration at Prieska, Prieska Annex and Jacomynspan also led to declining exploration activity at the other prospects. In general little work was done away from mineralised targets of surface or sub-cropping nature, most of which were identified by regional geochemical and mapping then followed up by geophysical surveys (IP and pulse EM) and shallow drilling. However du Toit (1998) notes that at the Boksputs Prospect, only one sulphide body has formed a gossan and the remainder are blind to surface. The Kantienpan deposit is also blind to surface and was discovered by EM methods. Roussow (2003) notes that much of the previous exploration was carried out prior to advances in the deposit model for VMS and SEDEX mineralisation. This increases the potential for further sulphide mineralisation to be identified on the Masiqhame prospecting right. Drilling at the Kantienpan Deposit was curtailed soon after discovery, due to a corporate decision by Iscor to stop all exploration and focus on Iron ore production. As a result a number of additional litho-geochemical and geophysical targets remain to be tested on the Prospecting Right Area. Orion believes that the integration of geochemical and geophysical methods may quickly enable new targets to be identified within the Masiqhame Prospecting Right, which overlies a highly prospective VMS horizon extending over more than 30km of strike. This horizon contains numerous published occurrences of copper, zinc, copper-zinc and zinc-copper mineralisation associated with massive sulphides. The Kantienpan Deposit is one of a number of Volcanogenic Massive Sulphide (VMS) hosted zinc-copper occurrences in the area of the Masiqhame Prospecting Right. The deposit was targeted by a combination of magnetic and time-domain electromagnetic ground surveys, following up on alteration identified by rock-chip sampling (Rossouw, 2003). 2.6 metres at 6.59% zinc and 0.35% copper (KN011). Drilling has confirmed the presence of significant mineralisation extending from 80 metres – 250 metres below surface and along 800 metres of strike. Mineralisation at the Kantienpan Deposit remains open both along strike and at depth. Orion’s maiden RC drill hole intersected 7m at 6.4%Zn. Orion’s initial work program also comprised a high powered fixed loop ground electromagnetic survey which identified the KN1 Conductor. The KN1 conductor is modelled to be substantially larger and highly conductive (~6000-8000S), being 3-4 times the conductance of the shallower, historically drilled, conductor, yet was not detected in the lower powered historical survey. 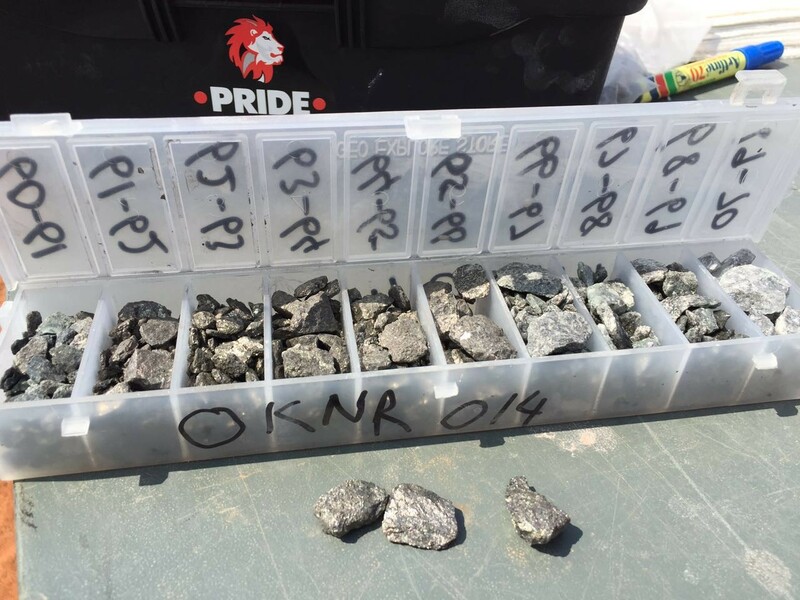 The Company has completed 3 drill holes for 1347.5m as a first test of the KN1 conductor and confirmed that the presence of massive and disseminated sulphide mineralisation with assay results including 2.05m at 9.93% Zn + 0.09% Cu from 404.87m (OKND016; refer ASX release 25 January 2017 and 25 May 2017).